This article lists various team and individual football records in relation to the Belgian national football team (The Red Devils)[A]. The page currently shows the records as of 18 November 2018, after the match against Switzerland. It didn't make sense at all, this match. The English probably found a dozen enough! Belgium-Sweden 1–8, Sweden cracks Belgium. For individual recognitions at major tournaments, see FIFA World Cup awards and UEFA European Championship Teams of the Tournament. All players with at least 35 caps are awarded a Medal of Recognition by the Royal Belgian Football Association; also players whose careers are ended by an injury after 20 games receive this award. Jan Vertonghen holds the record for most Belgium international appearances. Jan Ceulemans, nicknamed Caje and Strong Jan, is Belgium's record captain. The top 10 most capped players - players with an equal number of caps are ranked in chronological order of reaching the milestone. As of 16 November 2018[update]. The records are collected based on data from FIFA and RSSSF. Hector Goetinck was the player with the longest career span, and the first national manager with the Belgian nationality. Fernand Nisot was Belgium's youngest player and the only who scored before the age of 17. Timmy Simons still made an international appearance at age 39. Romelu Lukaku is the all-time top scorer with 45 goals. Jef Mermans scored in seven matches in a row. Belgium's 'hat-trick hero' Robert De Veen scored three hat-tricks. In 2016, Christian Benteke scored the quickest ever goal in a competitive international so far, 8.1 seconds after kick-off. Marc Wilmots (pictured) and Romelu Lukaku became Belgium's all-time top scorers at the World Cup with five goals. Jef Jurion, the second most serving Belgium captain, became Belgian champion nine times with Anderlecht. —Word-play in a 2004 newspaper heading. Only in one match of Belgium so far, two players received a red card. Both were very displeased with their five- and three-day suspensions afterwards. RSC Anderlecht, 11; in the match vs Netherlands on 30 September 1964 in the second half all players were from Anderlecht. 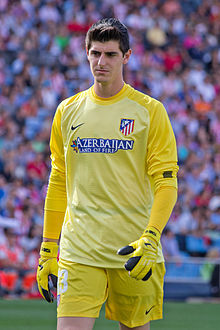 Thibaut Courtois holds the record for clean sheets. ^ These records and statistics include caps and goals against Romania on 14 November 2012, against Luxembourg on 26 May 2014 and against Czech Republic on 5 June 2017, which were counted by RBFA, but are not officially recognised by FIFA – the former two due to an excessive number of substitutions according to the Laws of the Game, the latter because the Belgian and Czech football federations were too late in requesting an official match. When applicable, footnotes clarify the discrepancy. ^ Goals scored in penalty shoot-outs do not count on a player's overall scoring tally. ^ "Football MATCH: 14.11.2012 (Romania v Belgium)". EU Football. Retrieved 17 November 2017. ^ "Football MATCH: 26.05.2014 (Belgium v Luxembourg)". EU Football. Retrieved 17 November 2017. ^ "Rules & Governance – Law 3: The number of players". The FA. Archived from the original on 25 October 2014. Retrieved 25 October 2014. ^ "Welles-nietesspel rond oefenmatch tegen Tsjechië: Daarom was het geen officiële wedstrijd" [Yes or no game about friendly against Czech Republic: this is why it was no official match] (in Dutch). Sporza. 6 June 2017. Retrieved 6 June 2017. ^ "Belgium - List of International Matches". RSSSF. Archived from the original on 1 July 2016. Retrieved 7 September 2013. ^ Vandewalle, Ludo (1 Mar 2001). "Rode Duivels zijn nog braaf". De Standaard (in Dutch). Retrieved 3 Jun 2015. ^ "Lach breekt door bij duivels..." De Telegraaf (in Dutch). 6 Jun 1994. Retrieved 8 Aug 2015. ^ "Nederland-België 5-5" (in Dutch). YouTube. 4 Sep 1999. Retrieved 3 Jun 2015. ^ "Voetbal - Voetbal in Engeland". Rotterdamsch Nieuwsblad (in Dutch). 9 Jan 1906. Retrieved 8 Aug 2015. ^ a b Guldemont, Henry; Deps, Bob (1995). 100 ans de football en Belgique: 1895–1995, Union royale belge des sociétés de football association (in French). Brussels: Vif. p. 66. ISBN 90-5466-151-8. ^ "België-Zweden 1–8, Zweden kraakt België". Het Vaderland (in Dutch). 30 May 1924. Retrieved 13 Jun 2015. ^ "Dertien maal een gat in de lucht..." De Tijd (Netherlands) (in Dutch). 26 Nov 1951. Retrieved 5 Jun 2015. ^ "FIFA/Coca-Cola World Ranking". FIFA. ^ "Belgium go top, Chile and Austria soar". FIFA. 5 November 2015. Archived from the original on 26 June 2016. Retrieved 5 Nov 2015. ^ "World Football Elo Ratings: Belgium". World Football Elo Ratings web site and Advanced Satellite Consulting. Archived from the original on 25 June 2016. Retrieved 18 Aug 2013. ^ Henshaw 1979, p. 76. ^ "Belgium v France − a 109-year-old rivalry". UEFA. 13 August 2013. Archived from the original on 25 June 2016. ^ a b Stokkermans, Karel (6 March 2014). "The "Derby der Lage Landen"". RSSSF. Archived from the original on 29 June 2016. Retrieved 16 May 2014. ^ Cruz, Santiago (12 Jun 2009). "Kirin Cup". RSSSF. Retrieved 10 Nov 2014. ^ "Belgium and Turkey claim awards, Hungary return". 3 December 2015. Archived from the original on 21 July 2016. Retrieved 30 Dec 2015. ^ "Belgium honoured with the FIFA Fair Play Award". FIFA News. 29 Jun 2002. ^ "Rode Duivels zijn grote slokop op Sportgala" (in Dutch). Sporza. 14 Dec 2014. Retrieved 14 Dec 2014. ^ a b "Belgium national football team match results". eu-football.info. Retrieved 5 September 2013. ^ "Alle Rode Duivels" (in Dutch). Royal Belgian Football Association. Retrieved 14 August 2013. ^ "Record-breaking Benteke scores after 8.1 seconds - European Qualifiers - News - Uefa.com". uefa.com. 10 October 2016. Retrieved 12 October 2016. ^ "Invaller Michy Batshuayi (bijna) snelste Rode Duivel ooit die scoort bij interlanddebuut" (in Dutch). nr10.be. Retrieved 6 June 2015. ^ "Friendly Match 1992 : France vs Belgium" (in French). Retrieved 21 June 2018. ^ Reunes, Marc (29 Oct 2004). "Duivels Goor en Deflandre rood van woede". Het Nieuwsblad (in Dutch). Retrieved 3 Jun 2015. ^ "Oranjeteam verslagen door dartel 'Anderlecht'". Het Vrije Volk (in Dutch). 1 Oct 1964. Retrieved 6 Jun 2015.